This past Monday, November 24, 2014 the decision of the Grand Jury to not indict Darren Wilson, the police officer who shot to death unarmed teenager Michael Brown Jr. in Ferguson, MO was released. Sadly, I was not surprised by the decision. However, I like many in Black communities around the U.S. as well as Internationally are frustrated by what we see as a disregard for Black males. The injustice is so clear that even the U.S. Justice Department is investigating the death of Michael Brown Jr. for possible civil rights violations. My anger and frustration is primarily because an unarmed person was shot 12 times and left dead & uncovered in the middle of the road for over four hours. I am not in law enforcement but I can’t understand the logic in shooting an unarmed person 12 times. Shooting to stop a person from fleeing or coming toward you I understand. Shooting an 18 year old or any person in the head is to kill and is excessive. Due to the excessive nature of the shooting is the reason why so many people are angry that there is no indictment and hence no trial. Monday evening in frustration and anger there was looting and arson of local businesses in Ferguson, MO. Violence and burning of communities will not lead to any productive solution. I understand the anger and the rage but violence only begets more violence. And the burning of Black communities only leaves burned out and boarded up businesses. There is low probability of rebuilding of these communities due to increased insurance and other expenses. I am a Chicago native who was born and raised on the West side in an area devastated by riots after the assassination of Dr. King. Almost 50 years later those neighborhoods are still lined with burned out and boarded up buildings. In my current town of Columbia, SC last night there were passionate but peaceful protest against the Grand Jury decision. The University of South Carolina NAACP chapter and later citizens in front of the SC State House demonstrated. 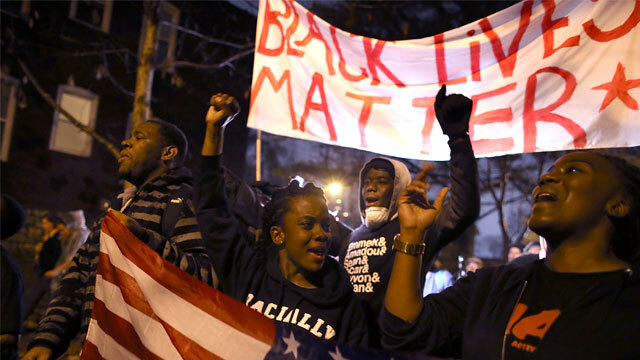 There are also protest still taking place in Ferguson, MO and other places around the nation. However, when days become weeks and weeks become months what will be the end result of the protest? This past weekend a 12 year old Black child with a toy gun was shot and killed by a rookie police officer. In addition, in recent interviews Darren Wilson has indicated he is sorry for shooting Michael Brown Jr. but has a clear conscious. I am baffled at how anyone can have a clear conscious after shooting someone 12 times who was unarmed, especially an 18 year old youth. Finally, even with the anger and frustrations surrounding the incident in Ferguson, MO as well as similar events, riots with looting and arson help no one. With this noted, even peaceful protest can do so much. In order for true change to occur law enforcement officials and community leadership & citizens must seek solutions together. I don’t like playing the race card but sometimes certain situations call for the obvious. This is especially when police officers fail to understand excessive force is not needed to defend and protect. Ultimately, it takes acknowledgement of a problem to help lead to a productive solution.